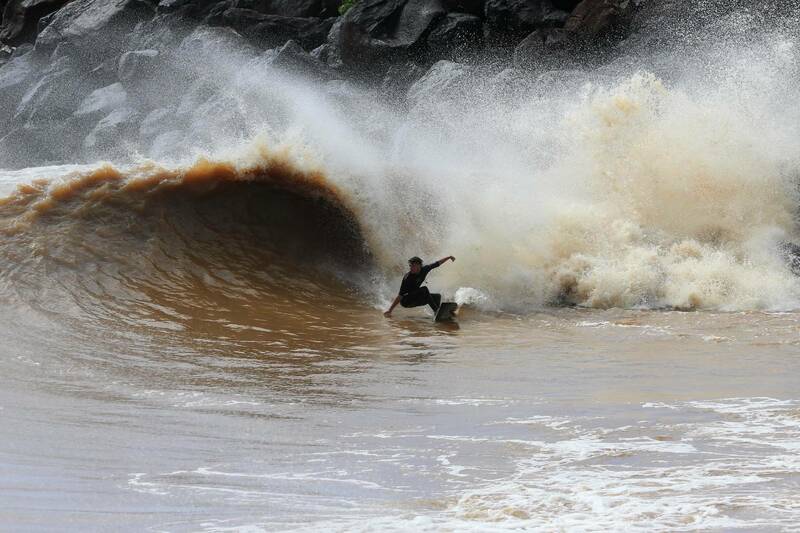 Jackson Coffey bottom turning out of a rippled, brown bend. 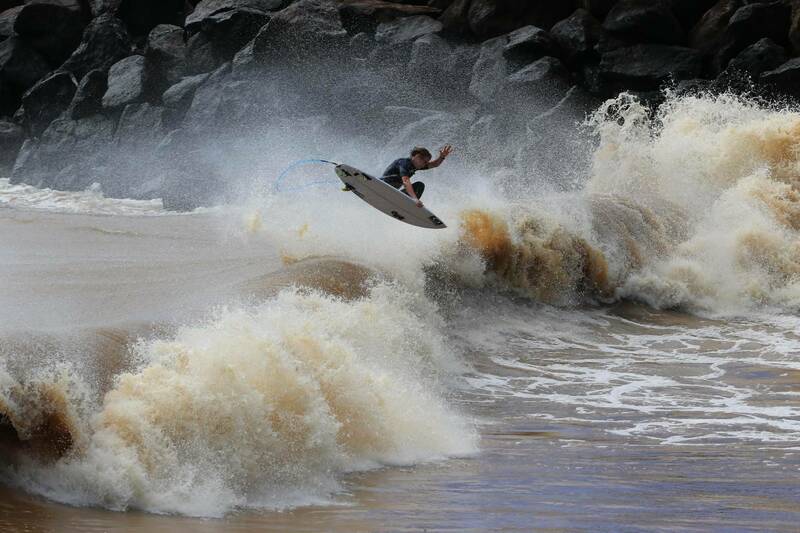 Sheldon Simkus lofts above a latte lip. Jackson swings off a neat little corner. Sheldon gaffing at the freshwater fusion. Sheldon disappearing down a Tweed River black hole. Check the head dip within the head dip. 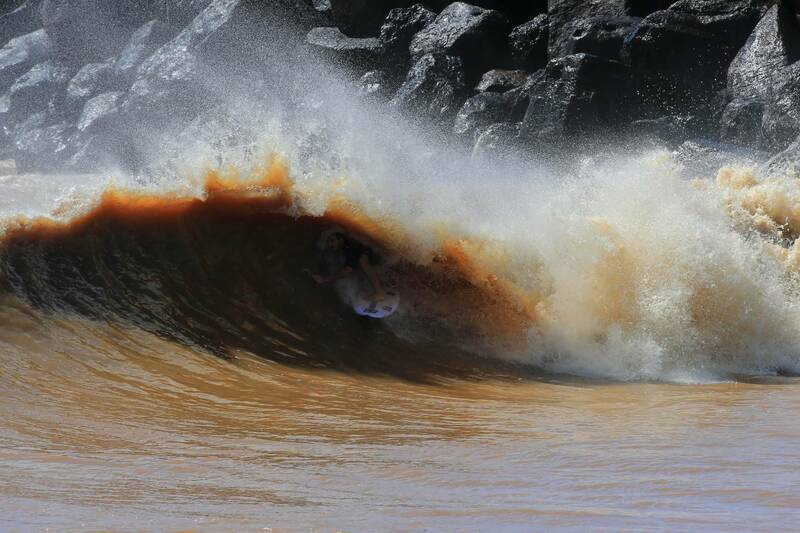 Just you, your mates, brown barrels and a few bull sharks. Jackson Coffey knifes an inside rail into a bronze nugget. 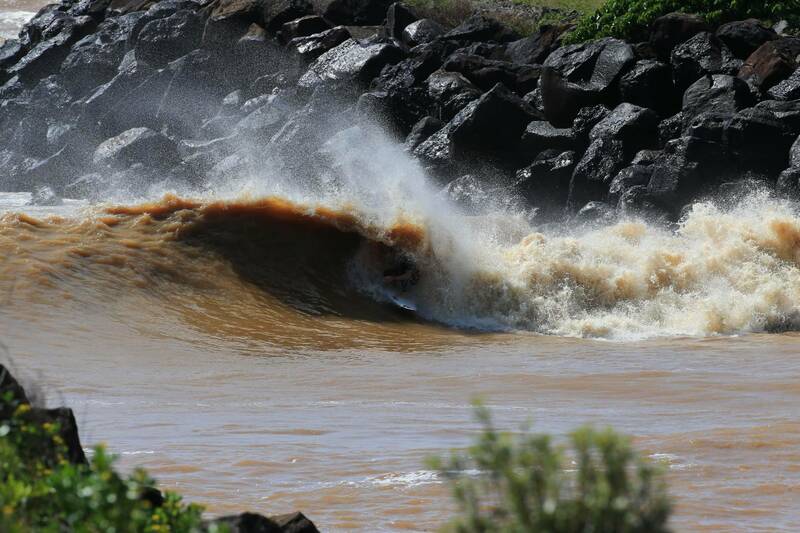 The Tweed River Superbank with the deepest, darkest barrels. 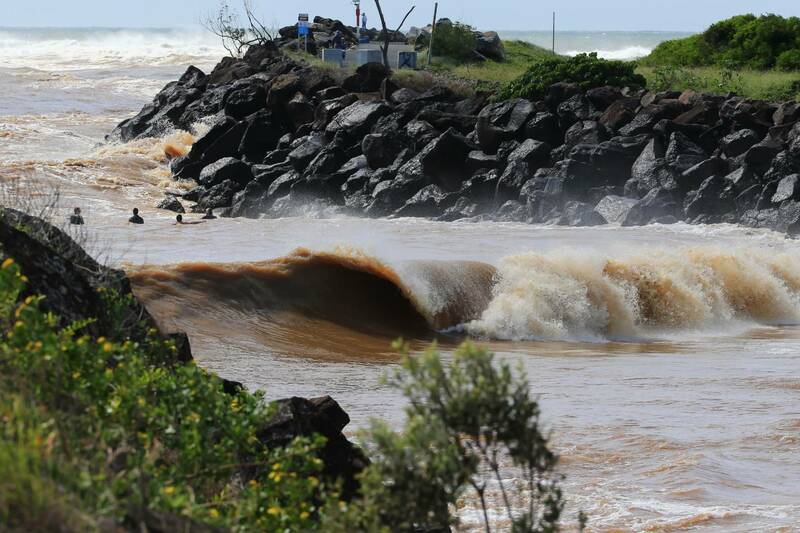 While the side effects of ex-cyclone Debbie wreaked havoc in Northern NSW, surfers were happy to capitalise on a rare bank formed by the floodwaters. 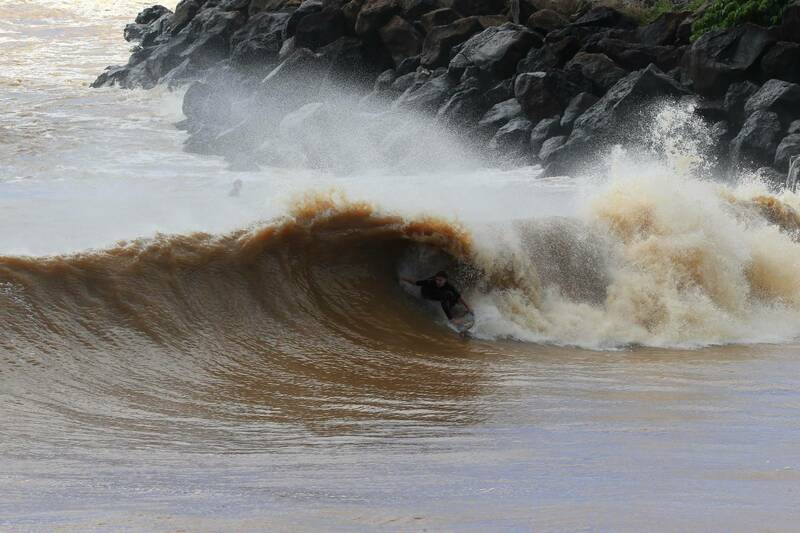 Riding the inside wall of the southern groyne of the tweed bar, the river rats dangled their toes amongst the bull sharks and fetid waters for a few chocolate carves and brown barrels. “It was so dark in the pit that you couldn’t even see them,” chuckled Gold coast lensman, Simon ‘Swilly’ Williams who was on hand to shoot the aptly named Jackson Coffey, Sheldon Simkus and Corbin Hutchins. For Simkus, the cave like quality of the pits was part of the attraction. 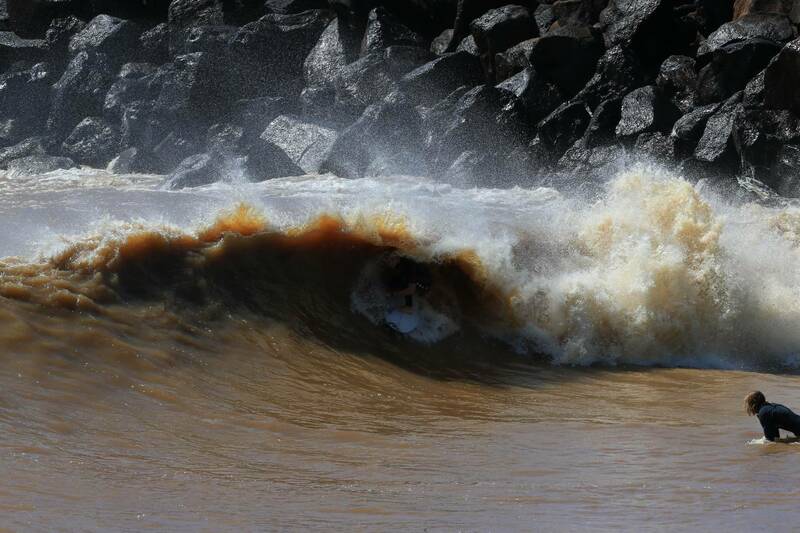 “It was almost black inside so that was something different,” he commented, still dripping in brown water after yesterday’s late session at the Tweed River. Simkus, a Tweed/Goldy local, suggests he always keeps an eye on the infrequently seen bank. 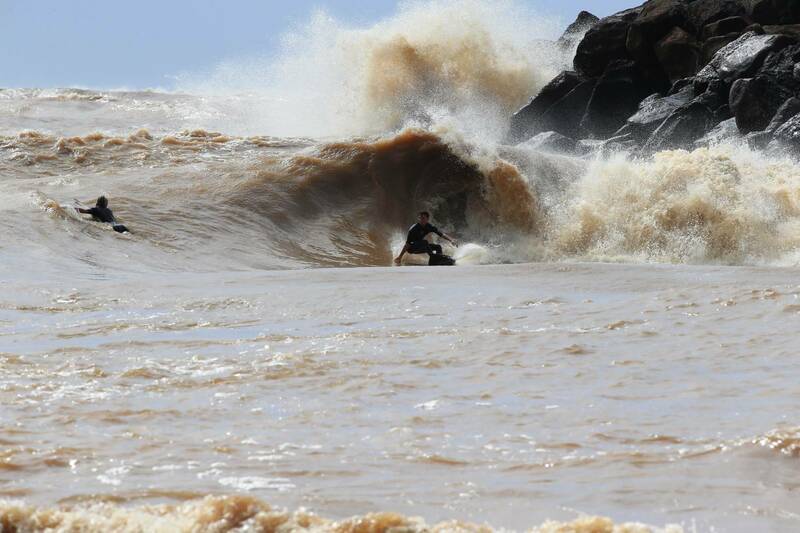 Although Sheldon missed the weekend’s super session he was adamant that yesterday was still the best he’s ever surfed it. When quizzed about the threat of bull sharks Sheldon concedes that you are always a little on edge and that he took specific measures to try and manage his fear. Sheldon was a little rattled when we informed him that former world number 2 turned nomadic fisherman, Mick Campbell, had counted 13 bull sharks swimming through the river when he was fishing off the northern groyne the other day. The murky flush of freshwater meant it was colder than usual and ensured wax jobs were slippery. The surfers were also hyper-conscious about swallowing any of the foul smellling, potentially bacteria-riddled liquid. Between the constant spitting to get rid of the foul taste in their mouths, the trio of the surfers also argued about the various merits of epoxies and standard PU boards in waves that have freshwater infusion. Apparently this has become quite an active debate since the advent of wave pools. 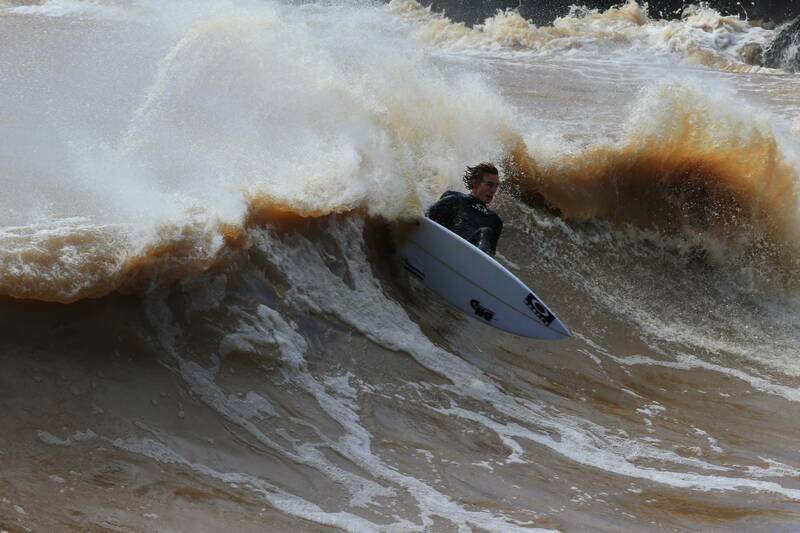 Despite the various risks associated with the session, for Sheldon the appeal ultimately came down to riding a wave, which presented a different set of challenges in a unique context. We can only assume that riding dreamy tubes and endless walls at the Superbank gets a little monotonous for a Gold Coast super grom. 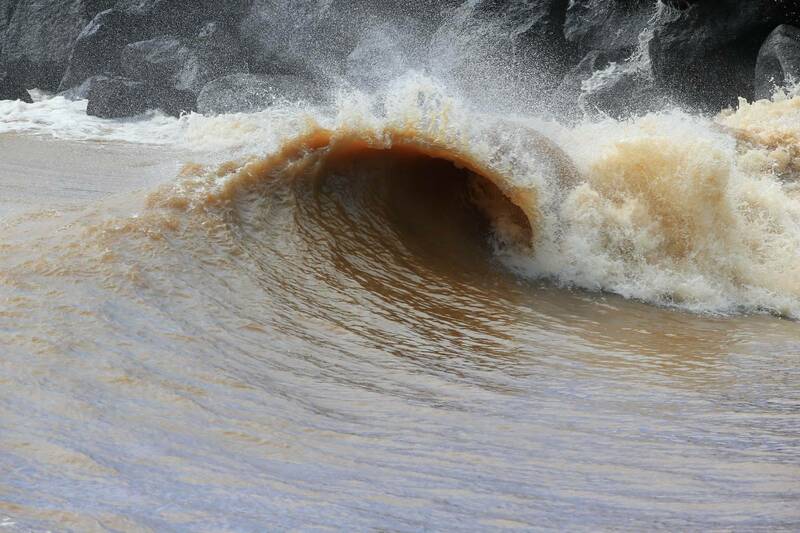 The Tweed River rights put a distinctive twist on the surfing experience. Just make sure you count your toes when you get out.